Visitors are welcome and we enjoy seeing and catching up with our graduates. If you are planning on visiting KHS, please let us know in advance so we can make arrangements with the main office. 55 KHS Band alumni helped to fill the stands at our 15th annual Band Alumni Night on Friday, January 4, 2018 with participants going back to the class of 2007. Thanks to the band council for all their help and to the In-Tune Music Boosters for organizing the reception. significant events happening in your lives. Keep in touch! Teresa Seidl ('72) enjoys the fun at Alumni Night 2010. Alert your fellow classmates of our website and encourage them to get in touch with us so we can expand upon our list of email addresses and alumni contact information. 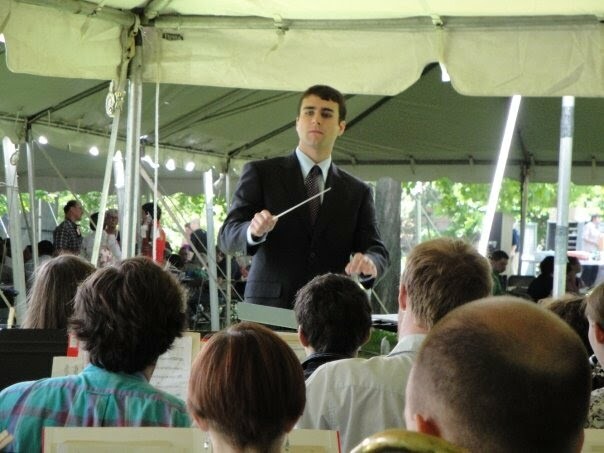 Ryan Branta ('05) conducts the Lawrence University Band during a graduation weekend concert in 2009. Ryan graduated with an instrumental music education major from Lawrence in 2010 and is a former Euphonium player from KHS. He currently teaches instrumental and general music at the American School Foundation of Monterey, Santa Catarina, Nuevo Leon, Mexico. Monica DeWild and Aaron Schultz (both '03) wedding reception 8/29/09. Pictured L-R: Meggie DeWild, Andrew Schultz('11), Monica, Mr. Gall, Aaron, and Aaron Hilber ('09). 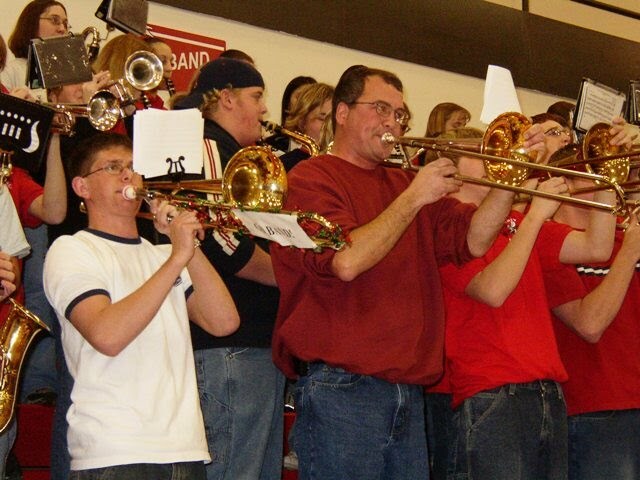 Brian Kaufman ('02) and Bob Van Thiel ('78) perform with the KHS Band. Steven Gruber, Tony Pyle, Aaron Muhowski, and Andrew Schultz, all members of the Pride of Wisconsin (2012)!